Many climbers are always longing for higher peaks to conquer. The beautiful Alps rise only until the 4.810m summit of the Mont-Blanc, so it is natural to look farther; and of course, no matter how far you look, the highest mountains of the planet rest on the Himalayas, the roof of the world. 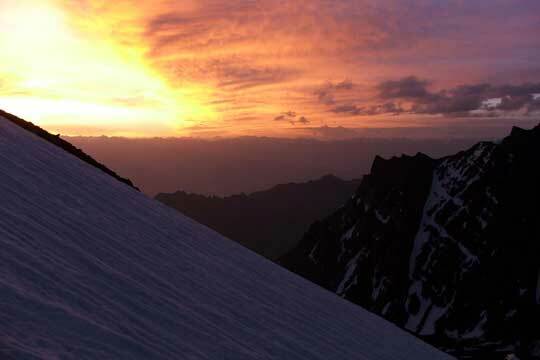 The Stok Kangri, with its 6.154m, is an ideal entry-level peak, “easily” conquerable by not so technical climbers. 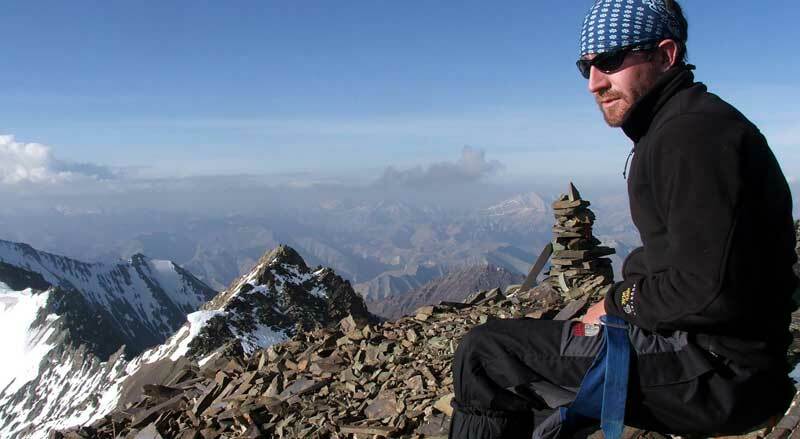 The Stok Kangri is technically simple, but its height makes it nevertheless challenging. Difficulty: technically one of the easier peaks – but any 6k summit is by default a challenge for the body, and therefore must not be underestimated. A previous and good adjustment to height is essential. Ascent requirements: other than the implied sure-footedness and absence of vertigo, a proficiency with crampons and ice axes is expected/recommended. The terrain is quite steep and the ridge is very exposed. Loose stones make the climb more difficult. The last 100m before the peak you will have to cross steep icy terrain. 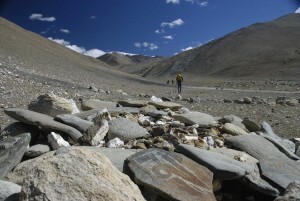 Location: Ladakh, Indus Valley, part of the Stok chain, easily reachable from Leh. Ascent duration: Usually 3-4 days (depending on physical condition and acclimatization). 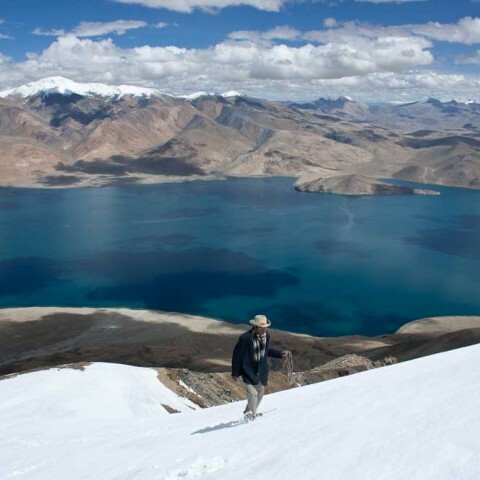 It can be combined with trekking routes of varying length in the Hemis National Park, since these also need a previous height adjustment. Best season to climb: from June to the end of September (always depending on weather conditions). Note! 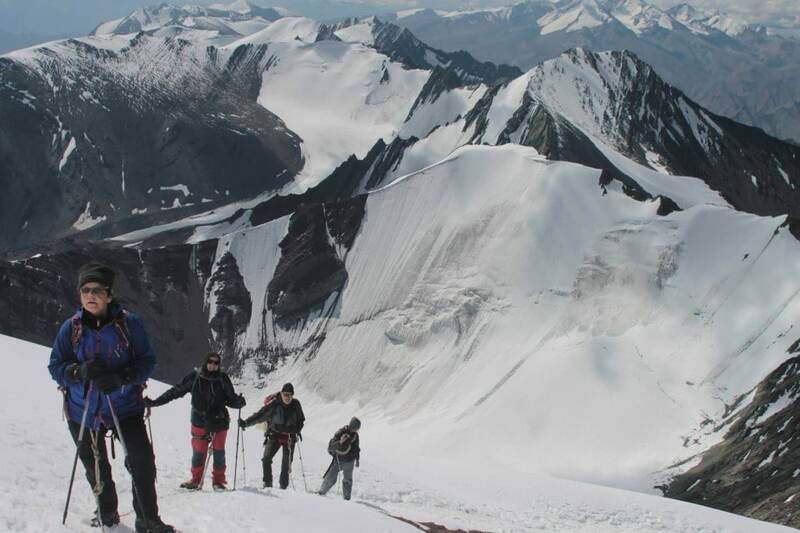 Permit: To climb the Stok Kangri you need a valid permit from the Indian Mountaineering Foundation. You can get one in Leh or even at the base camp. Currently it costs 30€ / person. 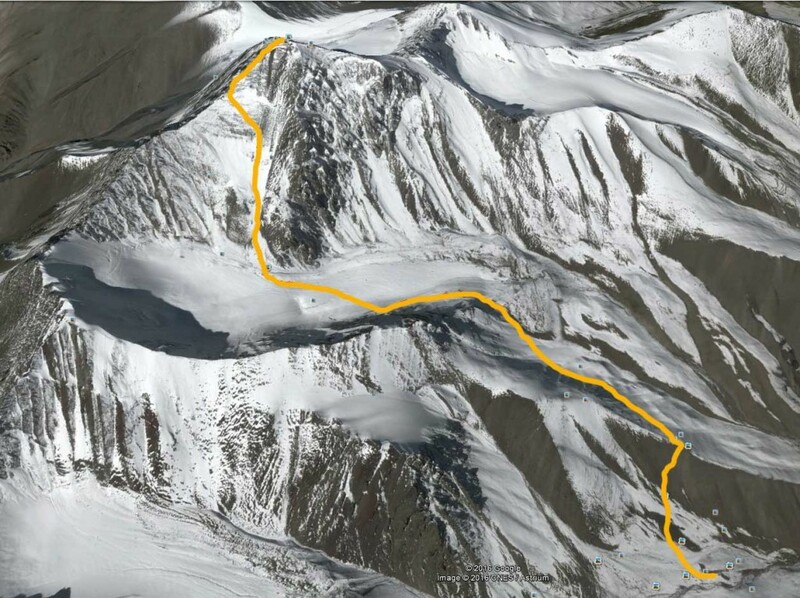 Ascent route of Stok Kangri (6.154m) from base camp. 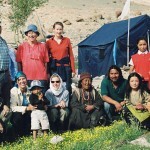 Leh is about 15km away from Stok and the trip by car takes approximately 30 min. 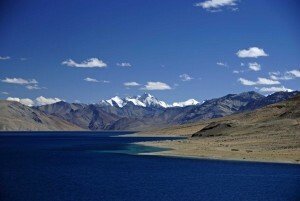 Stok is also the seat of the royal family of Ladakh (it is a de facto royalty, devoid of political power). The palace is worth a short visit. At the end of the village is the starting point of the tour. First, a slow walk uphill along a glacial stream. After a while, it is necessary to overcome a small but steep pass. 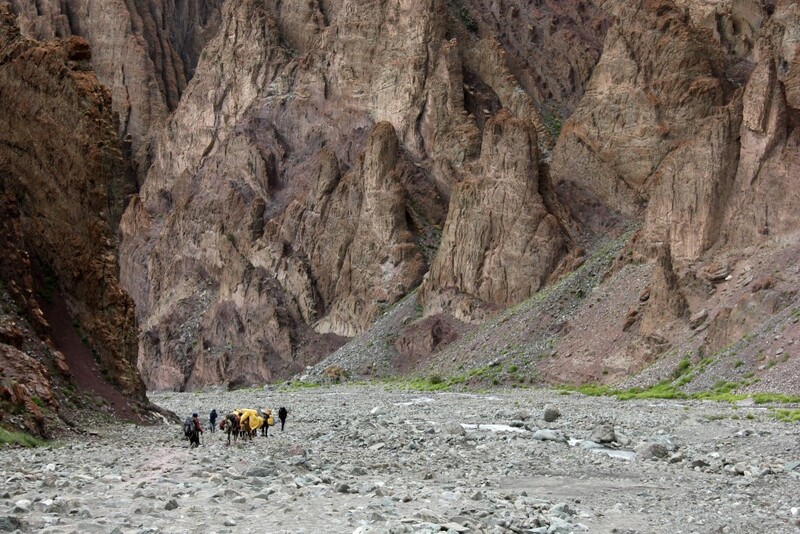 The route goes by impressive rock formations in the Stok Valley. Then it goes downhill until the creek, which we follow all the way to the night camp in Smankarmo. Smankarmo serves the people of Stok as summer pastures for their animals. The maximum inclination on this day is about 40%, with an average of only about 10%. Height of the camp: just below 4.400m. Height difference: + 900 / -125m. The second day is a short one. We leave the campground and say “Julley” to the shepherds of the Stok grasslands. The route goes then uphill to the high valley, and past some stone huts belonging to the shepherds. The road is steep, but after approximately 3 hours we reach the base camp, just below 5,000m. From here we can see the glaciers of Golep Kangri, the smaller brother of Stok Kangri. At the same time, one can look down into the Indus and its green oases. For a better height adjustment and as preparation for the next day, a further increase in altitude is recommended before the short night’s sleep. Max. Inclination: 44%, with an average of 18%. Walking time: about 3 hours. Height difference: + 623m / -23,3m. The night is very short, because we start to climb again when it is still dark – usually around 2am. With clear skies and good moonlight it is possible to go on without a head lamp. The route is also a bit steep at the start. It crosses a pass and rises steadily until you reach the Advanced Base Camp (ABC at 5.300m). After that, it’s time to walk over a flat glacier. 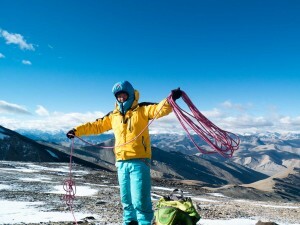 Rope is usually not a must, since there are hardly any gaps, but it may be necessary to put the crampons on. Finally, we reach the long summit slope. We climb steeply, until about 5.700m, and branch off towards the summit ridge. Then we follow the ridge over several short steep sections until the top of the Stok Kangri at 6.154m (or less ;)). For this last bit, the use of ropes and crampons is also an option. 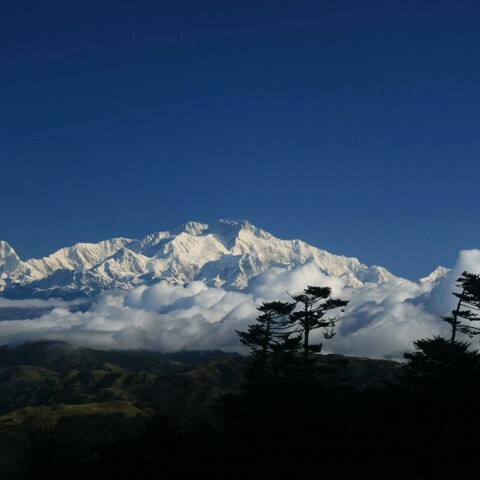 In good weather, the summit offers a panoramic view of the mountains of Stok-, Ladakh and Zanskarkette, and the peaks of the Karakoram to the north. After a short break, the route goes the same way back to the base camp. Max. Inclination: 84%, average 23.5%. Height difference: + 1.130m / -55m. 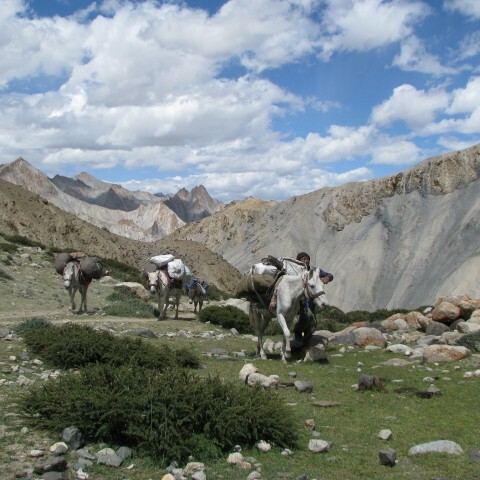 The panoramic view of the surrounding mountains from Stok Kangri makes up for the hardships of the climb. The way back to Stok follows the same route, if downhill and in opposite direction. After arriving in Leh, a celebration is in order (over a bottle of Godfather or Kingfisher, maybe?). A last look at the Stok Kangri before heading back to Leh.